Area: 923.8 thousand sq. km. (356,700 sq. mi.) about the size of California, Nevada, and Arizona. Cities: Capital: Abuja (pop. est. 1.6 million). Other cities — Lagos (11.4 million), Kano (3.3 million), Ibadan (3.3 million), Benin City (1.2 million), Port Harcourt (1.2 million), Maiduguri (1.1 million), Zaria (1.0 million). Terrain: Ranges from southern coastal swamps to tropical forests, open woodlands, grasslands, and semi-desert in the far north. The highest regions are the Jos Plateau 1,200-2,400 meters above sea level and the mountains along the border with Cameroon. Climate: Annual rainfall ranges from 381 cm. along the coast to 64 cm. or less in the far north. Nationality: Noun and adjective — Nigerian(s). Population growth rate (2010): 2.0%. Total fertility rate (avg. number of children per woman in 2010): 4.82. Ethnic groups (250): Hausa-Fulani, Igbo, Yoruba, and Kanuri are the largest. Languages: English (official), Hausa, Igbo, Yoruba, Fulani, Kanuri, others. Education: Attendance (secondary): male 32%, female 27%. Literacy — 39%-51%. Health: Life expectancy (2010): 47 years. Budget (2010): $30.7 billion, of which recurrent expenditures constitute $13.8 billion, capital expenditures $12.3 billion, statutory transfers $1.2 billion, and debt service $3.3 billion. Critical sectors — security and the Niger Delta (20%); education (8%); transportation (7%); agriculture and water (5%); and energy (5%). Indebtedness, including federal/state government debt, as percentage of GDP: 3%. Real GDP growth rate (2009): 6.1%. 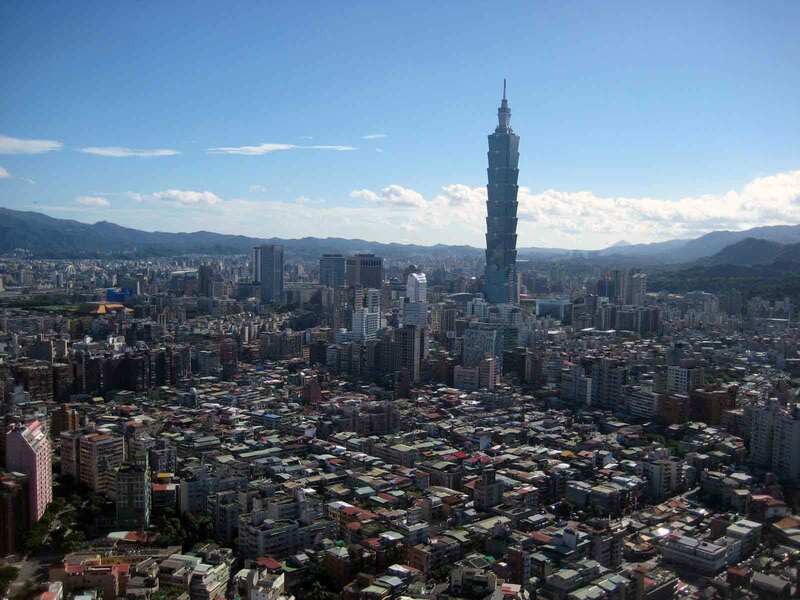 Per capita GDP (2009): $2,300. Natural resources: Oil and natural gas (37% of 2006 GDP), tin, columbite, iron ore, coal, limestone, lead, zinc. Agriculture (40% of GDP): Products: cocoa, palm oil, yams, cassava, sorghum, millet, corn, rice, livestock, groundnuts, cotton. Industry: Types: textiles, cement, food products, footwear, metal products, lumber, beer, detergents, car assembly. Trade (2007): Exports: $65.5 billion: fuels and mining products (97%); agricultural products (cocoa, rubber, oil, nuts) (2.2%); manufactures (0.8%). Partners — United States (38.3%); European Union (21.8%); India (9.9%); Brazil (6.8%); Japan (4%). Imports — $29.5 billion: machinery; chemicals; transport equipment; manufactured goods (72.3%); agricultural products (23.7%), fuels and mining products (4%). Partners — European Union (33.2%); United States (15.6%); China 7.2%; Korea (2.8%); U.A.E. (2.6%); others (15%). Foreign direct investment (FDI, 2008): 29.5% of GDP. Official development assistance (2006): $11.434 billion. 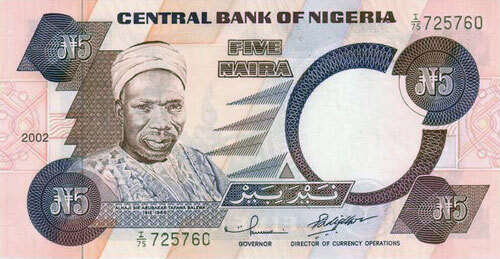 Currency: Naira (157 Naira = U.S. $1 as of October 19, 2011). 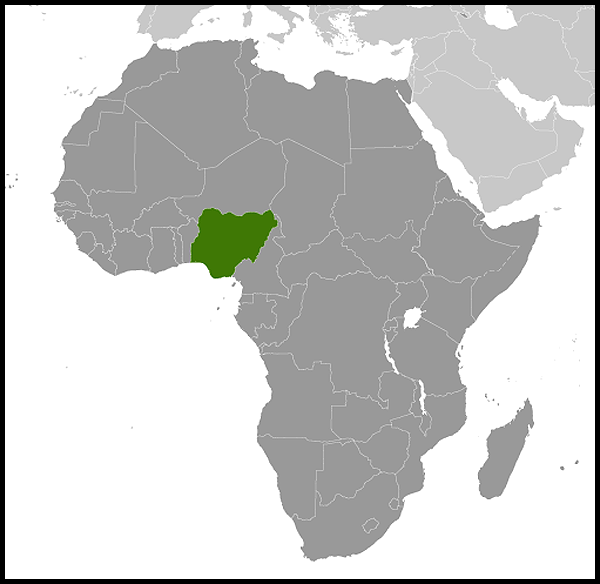 The most populous country in Africa, Nigeria accounts for over half of West Africa's population. Although less than 25% of Nigerians are urban dwellers, at least 24 cities have populations of more than 100,000. The variety of customs, languages, and traditions among Nigeria's 250 ethnic groups gives the country a rich diversity. The dominant ethnic group in the northern two-thirds of the country is the Hausa-Fulani, most of whom are Muslim. Other major ethnic groups of the north are the Nupe, Tiv, and Kanuri. The Yoruba people are predominant in the southwest. About half of the Yorubas are Christian and half Muslim. The predominantly Catholic Igbo are the largest ethnic group in the southeast, with the Efik, Ibibio, and Ijaw comprising a substantial segment of the population in that area. Persons of different language backgrounds most commonly communicate in English, although knowledge of two or more Nigerian languages is widespread. Hausa, Yoruba, Igbo, Fulani, and Kanuri are the most widely used Nigerian languages. In the southwest, the Yoruba kingdom of Oyo was founded about 1400, and at its height from the 17th to 19th centuries attained a high level of political organization and extended as far as modern Togo. In the south central part of present-day Nigeria, as early as the 15th and 16th centuries, the kingdom of Benin had developed an efficient army; an elaborate ceremonial court; and artisans whose works in ivory, wood, bronze, and brass are prized throughout the world today. In the 17th through 19th centuries, European traders established coastal ports for the increasing traffic in slaves destined for the Americas. Commodity trade, especially in palm oil and timber, replaced slave trade in the 19th century, particularly under anti-slavery actions by the British Navy. In the early 19th century the Fulani leader, Usman dan Fodio, promulgated Islam and brought most areas in the north under the loose administrative control of an empire centered in Sokoto. The United Kingdom administered northern and southern Nigeria separately, as northern leaders retained their religion-based administrative structures under an "indirect rule" arrangement with colonial authorities. Western influence and education proceeded more rapidly in the south than in the north, with the social, cultural, and political consequences still evident today. Following World War II, Nigerian nationalism and demands for independence resulted in successive constitutions legislated by the British Government moving Nigeria toward representative self-government. Nigeria gained full independence in October 1960, as a federation of three regions (northern, western, and eastern) under a constitution that provided for a parliamentary form of government. Under the constitution, each of the three regions retained a substantial measure of self-government. The federal government was given exclusive powers in defense and security, foreign relations, and commercial and fiscal policies. In October 1963, Nigeria altered its relationship with the United Kingdom by proclaiming itself a federal republic and promulgating a new constitution. A fourth region (the midwest) was established that year. On January 15, 1966, a small group of army officers, mostly southeastern Igbos, overthrew the government and assassinated the federal prime minister and the premiers of the northern and western regions. The federal military government that assumed power was unable to address ethnic tensions or produce a constitution acceptable to all sections of the country. Its efforts to abolish the federal structure greatly raised tensions and led to another coup in July. The coup-related massacre of thousands of Igbo in the north prompted hundreds of thousands of them to return to the southeast, where increasingly strong Igbo secessionist sentiment emerged. A constituent assembly was elected in 1977 to draft a new constitution, which was published September 21, 1978, when the ban on political activity, in effect since the advent of military rule, was lifted. Political parties were formed, and candidates were nominated for president and vice president, the two houses of the National Assembly, governorships, and state houses of assembly. In 1979, five political parties competed in a series of elections in which a northerner, Alhaji Shehu Shagari of the National Party of Nigeria (NPN), was elected president. All five parties won representation in the National Assembly. On December 31, 1983, the military overthrew the Second Republic. Maj. Gen. Muhammadu Buhari emerged as the leader of the Supreme Military Council (SMC), the country's new ruling body. He charged the civilian government with economic mismanagement, widespread corruption, election fraud, and a general lack of concern for the problems of Nigerians. He also pledged to restore prosperity to Nigeria and to return the government to civilian rule but was stymied in his attempt to deal with Nigeria's severe economic problems. Despite relative popularity for its no-nonsense approach in tackling corruption, the Buhari government was peacefully overthrown by the SMC's third-ranking member, Army Chief of Staff Maj. Gen. Ibrahim Babangida, in August 1985. Babangida moved to restore freedom of the press and to release political detainees being held without charge. As part of a 15-month economic emergency, he announced stringent pay cuts for the military, police, and civil servants and enacted similar cuts for the private sector. Imports of rice, corn, and wheat were banned. Babangida orchestrated a national debate on proposed economic reform and recovery measures, which reportedly convinced him of intense opposition to an economic recovery package dependent on an International Monetary Fund (IMF) loan. In early 1989, a constituent assembly completed work on a constitution for the Third Republic, and political activity again was permitted. In April 1990, mid-level officers tried and failed to overthrow Babangida, and 69 accused coup plotters were later executed after secret trials before military tribunals. In December 1990 the first stage of partisan elections was held at the local government level, followed by gubernatorial and state legislative elections in December 1991; elections were peaceful but turnout was low. However, Babangida canceled primaries scheduled for August and September 1992 due to fraud. All announced candidates were disqualified from again standing for president once a new election format was selected. After delayed promises for elections in 1990, the government finally held a presidential election on June 12, 1993. In what most observers deemed to be Nigeria's fairest elections, early returns indicated that wealthy Yoruba businessman M.K.O. Abiola had won a decisive victory. But on June 23, Babangida, using several pending lawsuits as a pretense, annulled the election, throwing Nigeria into turmoil. More than 100 persons were killed in riots before Babangida agreed to hand power to an "interim government" on August 27. Babangida then attempted to renege on his decision. Without popular and military support, he was forced to hand over to Ernest Shonekan, a prominent nonpartisan businessman. Shonekan was to rule until new elections, slated for February 1994. Although he had led Babangida's Transitional Council since early 1993, Shonekan was unable to reverse Nigeria's ever-growing economic problems or to defuse lingering political tension. With the country sliding into chaos, Defense Minister Sani Abacha quickly assumed power and forced Shonekan's "resignation" on November 17, 1993. Abacha dissolved all democratic political institutions and replaced elected governors with military officers. Abacha promised to return the government to civilian rule but refused to announce a timetable. Following the annulment of the June 12 election, the United States and other nations imposed various sanctions on Nigeria, including restrictions on travel by government officials and their families and suspension of arms sales and military assistance. Additional sanctions were imposed as a result of Nigeria's failure to gain full certification for its counternarcotics efforts. Although Abacha's takeover was initially welcomed by many Nigerians, disenchantment grew rapidly. Many opposition figures formed the "National Democratic Coalition (NADECO)" to campaign for an immediate return to civilian rule, and most Nigerians boycotted the May 1994 polls for delegates to a government-sponsored Constitutional Conference. On June 11, 1994, using the groundwork laid by NADECO, Abiola declared himself president and went into hiding. He reemerged and was promptly arrested on June 23. A series of strikes by petroleum workers and other unions initially brought economic life in Lagos and the southwest to a standstill, but by mid-August Abacha had dismissed the national union leadership, arrested his opponents, closed media houses, and moved strongly to curb dissent. In early 1995, Abacha alleged that some 40 military officers and civilians were engaged in a coup plot, including former head of state Obasanjo and his deputy, retired Gen. Shehu Musa Yar'Adua. After a secret tribunal, most of the accused were convicted, and several death sentences were handed down. The tribunal also charged, convicted, and sentenced prominent human rights activists, journalists, and others — including relatives of the coup suspects — for their alleged "anti-regime" activities. In an October 1, 1995 address to the nation, Gen. Sani Abacha announced the timetable for a 3-year transition to civilian rule. Public turnout for his sham local elections in December 1997 and in April 1998 state assembly and gubernatorial elections was under 10%, and public reaction to Abacha's presidential nomination by the five accepted parties was apathy and a near-complete boycott. Widely expected to succeed himself as a civilian president on October 1, 1998, he remained head of state until his death on June 8 of that year. During the Abacha regime, the government continued to enforce its arbitrary authority through the federal security system — the military, the state security service, and the courts. Under Abacha, all branches of the security forces committed serious human rights abuses. Abacha was replaced by General Abdulsalami Abubakar, who subsequently released almost all known civilian political detainees and decreased the number of reported human rights abuses. The PRC promulgated a new constitution, based largely on the suspended 1979 constitution, before the May 29, 1999 inauguration of the new civilian president. The constitution included provisions for a bicameral legislature, the National Assembly, consisting of a 360-member House of Representatives and a 109-member Senate. The executive branch and the office of president retained strong federal powers. The legislature and judiciary, having suffered years of neglect, needed to rebuild as institutions and begin exercising their constitutional roles in the balance of power. In the years following the end of military rule, Nigeria witnessed recurrent incidents of ethno-religious and community conflicts, many of which derived from distorted use of oil revenue wealth, flaws in the 1999 constitution, and longstanding disputes over the distribution of land and other resources. In May 1999, violence erupted in Kaduna State over the succession of an Emir, resulting in more than 100 deaths. In November 1999, the army destroyed the town of Odi in Bayelsa State and killed scores of civilians in retaliation for the murder of 12 policemen by a local gang. In Kaduna in February-May 2000 over 1,000 people died in rioting over the introduction of criminal Shar'ia in the state. Hundreds of ethnic Hausa were killed in reprisal attacks in southeastern Nigeria. In September 2001, over 2,000 people were killed in inter-religious rioting in Jos. In October 2001, hundreds were killed and thousands displaced in communal violence that spread across the Middle-Belt states of Benue, Taraba, and Nasarawa. On October 1, 2001, President Obasanjo announced the formation of a National Security Commission to address the issue of communal violence. In 2003, he was re-elected in contentious and highly flawed national elections and state gubernatorial elections, which were litigated over 2 years. Since 2006, violence, destruction of oil infrastructure, and kidnappings of primarily expatriates in the oil-rich Niger River Delta have intensified as militants demanded a greater share of federal revenue for states in the region, as well as benefits from community development. For many reasons, Nigeria's security services have been unable to respond effectively to the security threat, which is both political and criminal. Nigeria held state legislative and gubernatorial elections on April 14 as well as presidential and national legislative elections on April 21, 2007, in which more than 35 political parties participated. U.S. and international observers reported overall a seriously flawed process with credible reports of malfeasance and vote rigging in some constituencies. The scope of violence that occurred also was regrettable. There were considerable degrees of difference in the conduct of elections among states, but serious differences were also observed within states during the two polling dates. The main opposition parties, All Nigeria People's Party (ANPP) and the Action Congress (AC), as well as numerous smaller political parties and the ruling People's Democratic Party (PDP) filed petitions to challenge the results of gubernatorial elections in 34 of Nigeria's 36 states. The Court of Appeal received 1,527 petitions, a tripling of the 527 petitions filed and received in 2003. Nigeria's National Electoral Commission (INEC) experienced significant problems, including politicization and lack of independence; lack of transparency in its operations and decision-making; and persistent failure to make adequate logistical arrangements for both voter registration and polling. However, Nigeria experienced its first transition of power between civilian administrations when President Obasanjo stepped down on May 29, 2007. Newly-elected President Umaru Yar'Adua, a respected governor from the northern state of Katsina, pledged publicly to make peace and security in the Niger Delta and continued electoral reform his top priorities. While much reform remained unimplemented, the Yar'Adua administration showed restraint in allowing the legislative and judicial branches to operate relatively freely. In October 2007 Patricia Etteh, the Speaker of the Federal House of Representatives, resigned over allegations of corruption, after intense legislative and public pressure. Of significance for Nigeria's system of checks and balances and the rule of law, on November 12, 2008 an appeals court upheld a lower court ruling that approved an opposition party's gubernatorial election appeal, effectively unseating the ruling party's incumbent in favor of the opposition candidate. By a 4-3 vote, Nigeria's Supreme Court on December 12, 2008 upheld the results of the presidential election and dismissed the appeals of the two other primary contenders. On November 23, 2009, President Yar'Adua was flown to Jeddah, Saudi Arabia for emergency medical treatment. After a prolonged absence, on February 9, 2010 the Nigerian National Assembly passed a resolution that transmitted presidential power to Vice President Goodluck Jonathan, giving him the title and responsibilities of Acting President. On March 17, 2010, Acting President Goodluck Jonathan dissolved the country's cabinet, and swore in new cabinet ministers on April 6, 2010. Following the death of President Yar'Adua on May 6, 2010, the Nigerian Chief Justice swore in Goodluck Jonathan as President. The 1999 constitution provides for a bicameral National Assembly consisting of a 360-member House of Representatives and a 109-member Senate. The president heads the executive branch. The judiciary includes a Supreme Court and lower courts. In April 2011, the Independent National Electoral Commission organized legislative, gubernatorial, and presidential elections. The opposition Action Congress of Nigeria captured additional governorships and National Assembly seats, although the majority of such positions continued to be held by the ruling PDP. President Jonathan captured 59% of the national vote, beating his main rival, Muhammadu Buhari of the Congress for Progressive Change, who won 32%. While imperfect, the elections were considered Nigeria's most successful since its return to multiparty democracy in 1999, and reversed a downward trajectory of successively flawed election processes. President Jonathan was sworn in on May 29, 2011. Nigeria maintains an embassy in the United States at 3519 International Place, NW, Washington, DC 20008, (phone: 202-986-8400, fax: 202-362-6552, website: (http://www.nigeriaembassyusa.org/); and consulates general in New York at 575 Lexington Ave., New York, NY 10022 (phone: 212-850-2217), and in Atlanta at 8060 Roswell Road, Atlanta GA 30350 (phone: 770-394-6161). Nigeria is the United States' largest trading partner in sub-Saharan Africa, largely due to the high level of petroleum imports from Nigeria, which supply 8% of U.S. oil imports — nearly half of Nigeria's daily oil production. Nigeria is the fifth-largest exporter of oil to the United States. Two-way trade in 2010 was valued at more than $34 billion, a 51% increase over 2009, largely due to the recovery in the international price of crude oil. Led by cereals (wheat and rice), motor vehicles, petroleum products, and machinery, U.S. goods exports to Nigeria in 2010 were worth more than $4 billion. In 2010, U.S. imports from Nigeria were over $30 billion, consisting overwhelmingly of crude oil. Cocoa, bauxite and aluminum, tobacco and waxes, rubber, and grains constituted about $73 million of U.S. imports from Nigeria in 2010. The U.S. trade deficit with Nigeria in 2010 was $26 billion. Nigeria was the 13th-largest trading partner for the United States in 2010. The United States is Nigeria's largest trading partner after the United Kingdom. Although the trade balance overwhelmingly favors Nigeria, thanks to oil exports, a large portion of U.S. exports to Nigeria is believed to enter the country outside of the Nigerian Government's official statistics, due to importers seeking to avoid Nigeria's tariffs and regulations. The United States is the largest foreign investor in Nigeria. The stock of U.S. foreign direct investment (FDI) in Nigeria in 2009 was $5.4 billion, up from $3.4 billion in 2008. U.S. FDI in Nigeria is concentrated largely in the petroleum/mining and wholesale trade sectors. Exxon-Mobil and Chevron are the two largest U.S. corporate players in offshore oil and gas production. The oil boom of the 1970s led Nigeria to neglect its strong agricultural and light manufacturing bases in favor of an unhealthy dependence on crude oil. Oil and gas exports account for more than 95% of export earnings and over 80% of federal government revenue. New oil wealth and the concurrent decline of other economic sectors fueled massive migration to the cities and led to increasingly widespread poverty, especially in rural areas. A collapse of basic infrastructure and social services since the early 1980s accompanied this trend. By 2002 Nigeria's per capita income had plunged to about one-quarter of its mid-1970s high, below the level at independence. Along with the endemic malaise of Nigeria's non-oil sectors, the economy continues to witness massive growth of "informal sector" economic activities, estimated by some to be as high as 75% of the total economy. Nigeria's publicly owned transportation infrastructure is a major constraint to economic development. Principal ports are at Lagos (Apapa and Tin Can Island), Port Harcourt, and Calabar. Docking fees for freighters are among the highest in the world. Of the 80,500 kilometers (50,000 mi.) of roads, more than 15,000 kilometers (10,000 mi.) are officially paved, but many remain in poor shape. Extensive road repairs and new construction activities are gradually being implemented as state governments, in particular, spend their portions of enhanced government revenue allocations. The government implementation of 100% destination inspection of all goods entering Nigeria has resulted in long delays in clearing goods for importers and created new sources of corruption, since the ports lack adequate facilities to carry out the inspection. Four of Nigeria's airports — Lagos, Kano, Port Harcourt and Abuja — currently receive international flights. There are several domestic private Nigerian carriers, and air service among Nigeria's cities is generally dependable. The maintenance culture of Nigeria's domestic airlines is not up to international standards. 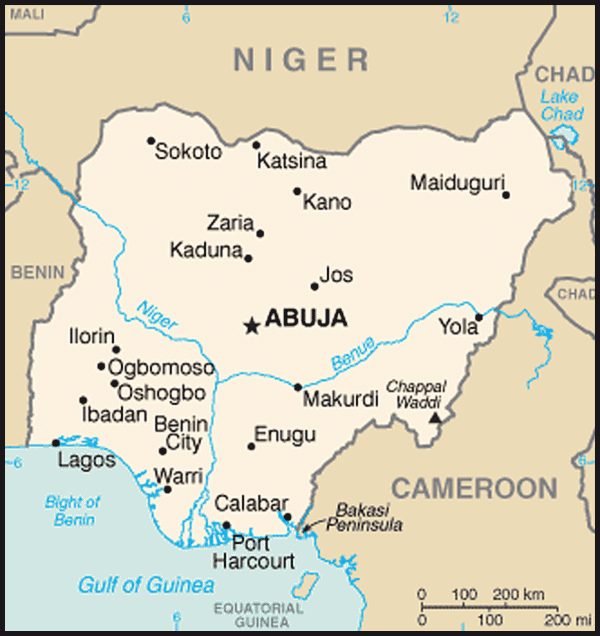 Since independence, Nigerian foreign policy has been characterized by a focus on Africa and by attachment to several fundamental principles: African unity and independence; peaceful settlement of disputes; nonalignment and nonintentional interference in the internal affairs of other nations; and regional economic cooperation and development. In pursuing the goal of regional economic cooperation and development, Nigeria helped create the Economic Community of West African States (ECOWAS), which seeks to harmonize trade and investment practices for its 15 West African member countries and ultimately to achieve a full customs union. Over the past decade, Nigeria has played a pivotal role in the support of peace in Africa. It has provided the bulk of troops for the UN peacekeeping mission in Sierra Leone (UNAMSIL), the UN Mission in Liberia (UNMIL), and many of the troops to the African Union Mission in Sudan (AMIS). The U.S. Foreign Commercial Service in Lagos, Nigeria (http://export.gov/nigeria/), and assistance for Nigerian companies seeking to find U.S. suppliers of goods and services.